Story: The words "health care" and "comedy" aren't usually found in the same sentence, but in Academy Award winning filmmaker Michael Moore's new movie SiCKO, they go together hand in (rubber) glove. Opening with profiles of several ordinary Americans whose lives have been disrupted, shattered, and -- in some cases -- ended by health care catastrophe, the film makes clear that the crisis doesn't only affect the 47 million uninsured citizens -- millions of others who dutifully pay their premiums often get strangled by bureaucratic red tape as well. After detailing just how the system got into such a mess (the short answer: profits and Nixon), we are whisked around the world, visiting countries including Canada, Great Britain and France, where all citizens receive free medical benefits. Finally, Moore gathers a group of 9/11 heroes - rescue workers now suffering from debilitating illnesses who have been denied medical attention in the US. He takes them to a most unexpected place, and in addition to finally receiving care, they also engage in some unexpected diplomacy. While Moore's SiCKO follows the trailblazing path of previous hit films, it is also something very different for Michael Moore. 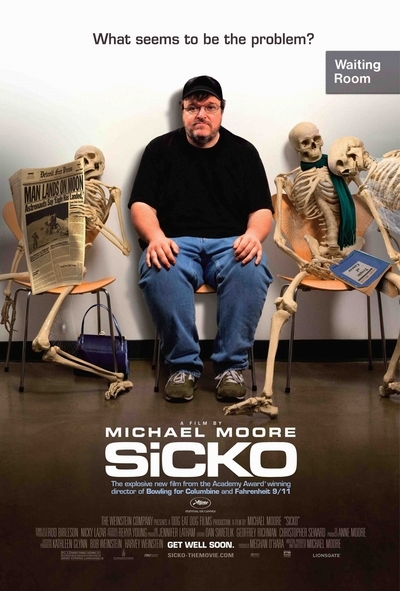 SiCKO is a straight-from-the-heart portrait of the crazy and sometimes cruel U.S. health care system, told from the vantage of everyday people faced with extraordinary and bizarre challenges in their quest for basic health coverage.